Maureen Lagasse is great and has really helped my son tremendously. She customizes her technique to his strenghts and focuses on his struggles, and also values our feedback in customizing his therapy. We had litte success previously, showing no improvement or flexibility in his therapy. We would recommend Maureen to anyone. Many of out friends are going elsewhere in Wallingford for speech therapy and not seeing the growth or improvement they see with my son. I have urged them to switch to TLC and see Maureen. Both Ms. Lynn levelly and Ms. Maureen are genuinely dedicated to helping their clients and connecting them to respective resources to help the entire family.They are very involved in the well being of their clients entire family and I would highly recommend her, andTLC to any of my friends who find themselves in need of speech therapy for their child. We are very fortunate to have had Lauren Holt take on our son’s case nearly a year ago. Lauren is knowledgeable in all facets of his care, and is always modifying his sessions to work towards his communication goals. She is professional. She is energetic. She is also an incredible advocate. 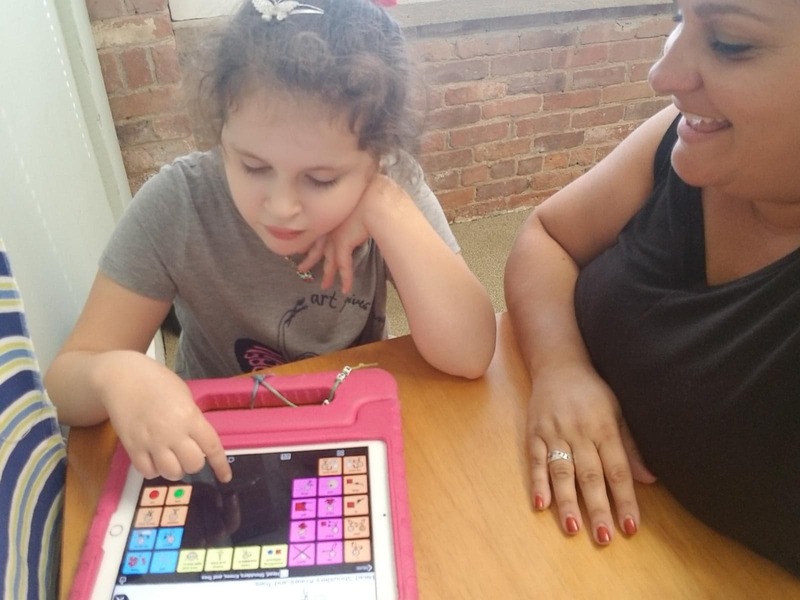 Our son is non-verbal, but has been able to begin to communicate through the use of his augmentative and alternative communication device (“AAC”) through her efforts. Lauren was also instrumental in having our public school system issue an AAC to him for his personal use, and to have his school’s goals modified to account for his use of the AAC. We are forever indebted to her and excited to continue working together! Positive, inviting, encouraging, experienced, thorough, professional and kid friendly are all words to describe TLC! When I realized I was the only one who understood my 2 1/2 year old son when he spoke, I spent months searching for a speech therapist… then I discovered TLC! This is where we met Maureen who touched our lives and hearts as Gavin’s speech therapist. He spent the first session in my lap and by the third session he was skipping down the hall to “play” with Miss Maureen. She was not only Gavin’s speech therapist, she was also his biggest cheerleader. Maureen was always positive and playful as she worked with Gavin. She quickly learned his interests and used those to engage him. My little guy loves construction so she knew how to motivate him to learn new sounds using what most caught his attention! She was also very clear as to how I could help Gavin at home. After less than a year of speech therapy, Gavin’s language tested equal to that of a 4 1/2 year old! Now everyone understands everything he says!! Tears of gratitude fill my eyes as I write our story…thank you “Miss Mareen” and thank you TLC! I would like to thank Lynn and Lauren for all their work, dedication, and kindness. Our son has grown in so many ways not with just speech. Confidence and perseverance, to try things that may be daunting any young teenager.Our son had gone to Lynn in 8th grade with a speech issue. We noticed it at a young age he had issue but was told it was developmental. In 8th grade my son asked if he could seek help. That is when the wonderment of TLC began. After several months of speech, his first daunting task was to speak for a town essay contest. Not a small task since he was being judged by a panel of adults and his peers. With courage and determination he placed 3rd. Lynn had worked on teaching the techniques with my son to say the “r” and “s” sounds and it very apparent it – worked! Next my son was introduced to Lauren at TLC. The summer of going into his freshman year, Lauren continued to work with Mike and he truly took to heart every exercise she had given him. He now is a freshman, he was asked to give an acceptance speech for the accepted students for incoming class of freshmen and parents of 2016, Approximately 300 people attended. A daunting task for anyone, no less a teenager still securing his new found skills. With a three page speech in hand and a very large podium in front of him he did so with such confidence. Smiles, applauds, nodding of heads from the audience once again proved Mike had made the correct journey with TLC Speech. To secure his confidence he had attended a fundraiser several days after his speech , a women came up to him and asked,”did you give an opening speech at Xavier?”. My son replied yes, she just smiled and said you are a natural at public speaking. My daughter was diagnosed with Apraxia of Speech just about a year ago. It was then we were referred to Lynn for speech therapy. We are about 40 minutes from Lynn’s office, so I was a little unsure if we could maintain the commute, but after seeing my daughter with Lynn on our first visit, I knew we had found the perfect speech therapist for her. My daughter is excited to go to speech and lights up when she sees Lynn. I hear my daughter in the room laughing and having a great time all while learning to speak. She gives Lynn 100% and I truly believe it’s because of Lynn’s warm and playful approach to speech therapy. They have truly developed a special bond. Not only does my daughter enjoy seeing Lynn, but I do too. I think Lynn is a wonderful person and really cares about my daughter and our family. I would not hesitate to recommend Lynn to anyone and in-fact I already have! My son Mason started at language and communication less than a year ago with very little to no language skills at all. He began working with Maureen and he has come such a long way!! He can now communicate his needs and wants and is talking in full sentences. Lynn and Maureen have been wonderful to us and we are very grateful to have found them for our son. I would definitely recommend Therapy for Language and Communication to anyone needing speech for their child as they have been a absolutely amazing to my family. I consider Lynn not only a crucial member of my daughter’s support team, but one for me as well. She is always there to listen and laugh with me through all of the craziness of raising a not so typical child. She offers suggestions and goes out of her way to provide us with the technology we need to try new ways of communication for our non- verbal child. I love hearing the laugher and excitement coming out of the room between the two of them while I am waiting! The way that Lynn interacts with children is so encouraging and upbeat. Though she can’t verbally tell me, I know mine is so happy to be with her by the way she runs down the hall to find her when we arrive. Lynn has so much energy, knowledge and dedication to share with the families she works with. She shared information about a communication program in FL using dolphin therapy that we were able to take part in last summer. She tailors the sessions to work on relevant goals set by the family, school or community as well. She worked tirelessly to ensure our daughter would be able to participate in receiving her first communion. Whatever your needs may be regarding speech and communication for your child, Lynn is the way to go! I hope you are able to meet her and have her become a part of your family’s life, just as she has become such a big part of ours. Lynn’s treatment approach is creative, progressive and strenght-based. Most importantly, her approach has been fun and highly effective for my son. She truly has a gift for working with children with autism spectrum disorders! Lynn LaValley has helped our daughter Nicole find more than her voice. She has helped her to be more confident and outgoing. Nicole began working with Lynn in the spring of 2010, at the age of 5. Up until that point, she did not speak much outside of our house and what she did say was very difficult to understand. Within 2 months of working one-on-one with Lynn, hearing her sing for the first time and talk to her cousins, brought tears to our eyes. Over the course of her therapy, Lynn has treated Nicole like she was her own child providing a fun, loving, supportive environment. Lynn has sought the advice and counsel of her peers as unusual speech patterns presented themselves. When progress appeared to stall, she performed a round of testing to help assess if there were other learning issues that were potentially inhibiting her so that we can address together. We have been so impressed with her willingness to partner with us, the school and our reading consultant to ensure Nicole’s success. We are extremely grateful for the professional speech services provided by Lynn LaValley. We would highly recommend her services to any parent with a child struggling to communicate. Being a speech language pathologist myself, my standards were extremely high when looking for someone to work with my son. Over the last year Lynn has supported not only my child, but my entire family. She is a warm, engaging, professional who remains current in her field and utilizes a variety of strategies and treatment approaches when working with her clients. We highly recommend her to anyone who is looking for speech and language services for their child. My son has been evaluated by numerous Speech Language Pathologists over the years. It was not until Lynn LaValley came into our lives that we were finally able to connect the dots and get a clear picture of what communication deficits were impacting his ability to communicate with his friends and family. Lynn came into our home and observed our son’s interactions with his family. Through this evaluation, Lynn determined that the focus of his therapy should be on social/pragmatic language. This information was presented at a PPT for carryover into his school environment. Lynn LaValley has been instrumental in both identifying and implementing strategies to improve Michael’s social communication. Our son lost valuable time in therapy that was not focused on his true communication deficit; pragmatic language as many other SLP’s were unable to truly detect what his weaknesses were. I look forward to watching my son grow and progress in his ability to communicate with his family and friends. Without the help of Lynn, this would not be possible. Sarah has done wonders for our daughter! Aside from Sarah’s excellent work with our daughter regarding speech services, Sarah helped us to receive services from our town! Our daughter was able to get into a special school program! We can not say enough about Sarah and how amazing she is. All the help she provided and outreach that she helped us with has been so very helpful to our daughter. We are so very lucky to have found Sarah and our daughter looks forward every week to see her! Thank you to Sarah and TLC you have made communicating with our daughter so helpful and easy we could not do it without you! I was recommended to TLC by my son’s pediatrician when he showed signs of speech delay. We have been seeing Lisa for almost two years now and I could not be more grateful that she was introduced to us. Anyone who’s child has a speech delay, know the signs of frustration are crying and screaming when we do not understand what our child needs. That was my son’s immediate reaction anytime anyone did not know what he was asking for or wanted. He spent months expressing himself this way to his family and even Lisa. Lisa never got upset. She knew Jacion was frustrated and always was calm and attentive towards him. She worked with him to figure out what he wanted and never showed one sign of frustration towards my son. I love how she tailored each week and month by my son’s progress. At first it was getting Jacion comfortable with Lisa so he enjoyed coming each week, and she would label each item or reactions so he could hear the son. Then she made us a customized binder with picture cards in it. She picked pictures of my son’s favorite foods or activities. This way my son could hand me the picture instead of screaming and crying when I did not know what he wanted. After ever session, she would bring me in the room during the last fifteen minutes, to show me what they worked on and what to mimic when I got home. It is almost,two years later and my son is starting to put words and sentences together. He enjoys going to TLC every Saturday to see Lisa. One thing I could say is that Lisa never made him feel like he was there to work. She made it feel like he was there to play but also incorporating speech without him knowing. It made it easy to go each week instead of him not wanting to go. I recommend anyone who has a child or adult who has a speech impairment to visit TLC. I honestly do not know how my son would be communicating today without Lisa and the whole crew at TLC.